The Get Up Kids seemed to take another break after their reunion full length, There Are Rules. 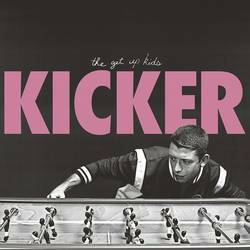 Seven years later, and we're given some new tunes in the form of an EP entitled, Kicker. It may be just 4 songs, but they are arguably the catchiest they've written since before reuniting. Kicker takes out the synths and exploratory elements of There Are Rules, and it focuses more on providing pop-punk hooks. "Maybe" has the band breaking out from their slumber with a lead guitar line that instantly grabs you with its lifts and dips. Lead guitarist, Jim Suptic, takes the reigns on "Better This Way" and really leaves his mark on Kicker with the pop-punk romper, "I'm Sorry." To close it out, Matt Pryor reminds listeners why they're one of the pioneers of late 90's/early 00's emo with "My Own Reflection." Kicker is a great way to spend 13 minutes. Fans should find it more than satisfactory after such a long wait. Especially those who prefer the band's "heyday" sound. It's marks a strong return for The Get Up Kids and possibly a good indication of things to come. Posted Aug. 27, 2018, 10:56 p.m.
Posted Jan. 23, 2015, 11:42 a.m.
Posted Dec. 17, 2013, 5:37 p.m.
Posted Sept. 21, 2013, 8:06 p.m.